Jacques Haeringer, executive chef and proprietor of the legendary L’Auberge Chez François restaurant in Great Falls, Virginia, is one of America’s most respected and innovative culinary personalities. Continuing in his late father François’ footsteps, Jacques specializes in reinterpreting Alsatian cuisine for American palates. Jacques loves serving up classic and contemporary French Alsatian fare at the restaurant and Jacques’ Brasserie, but with his boundless energy he can also be found teaching gourmet cooking classes, hosting wine pairing dinners, writing magazine articles, and appearing on local news and national television shows like NBC’s Today Show and The Talk on CBS. 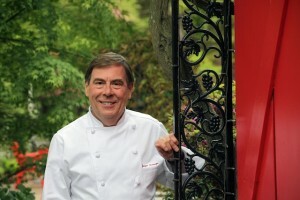 Jacques’ culinary roots began when his father opened Chez François, an authentic Alsatian restaurant near the White House in Washington, DC, in 1954. When the building was sold in 1976, L’Auberge Chez François moved to the picturesques setting in Northern Virginia reminiscent of the French countryside, and today it remains one of the DC metro area’s most popular and recognized French restaurants. Jacques and his staff have won numerous awards, such as the coveted AAA Four Diamond and was ranked by Open Table’s subscribers as a Top 100 Restaurant of 15,000 nationwide and Top 10 Local DC Restaurant. The restaurant has been voted “Most Romantic”, “Best French”, and “Best Service” by readers of Washingtonian Magazine for over 25 years. Chef Jacques is the author of “Two for Tonight” a collection of recipes that inspire romance through food and togetherness, and the “Chez François Cookbook,” the bible of classic Alsatian cuisine featuring some of the restaurant’s most popular recipes. Chef Jacquus hosted a PBS series based on the book, Two for Tonight, and Les Desserts, both now available for purchase on DVD. He was also the host of A Bite of History for the History Channel, as seen on the Chef Jacques Haeringer’s YouTube Channel. His articles and recipes have been featured in Bon Appetit, Gourmet, Wine & Spirits, Southern Living, Bridal Guide, Cosmopolotan, Better Homes and Gardens, Wildfowl and Cooking Light, to name a few.